ACNE SKIN CARE FOR YOU! A high percentage of individuals have been tormented by skin problems like blemishes, rashes, pimples, blackheads and acne. These problems are commonly experienced during puberty or an early stage in life where people tend to be most socially insecure. Aside from being physical, the effects can also be psychological. It can drain an individual’s self-esteem and confidence. Some individuals may continue experiencing acne related skin infections decades later and it may eventually diminish during early adulthood for most people. There is now way of predicting when it will gradually decrease or fully disappear. Pimples, blackheads, and blemishes are among the most common skin infections caused by acne. The infection is a result of excessive secretions of oil from the skin glands and its buildup when a skin pore is blocked. Upper regions of the body like the face, chest, back and upper arms are commonly infected. Acne can be irritating for most people since it can almost be unpredictable and uncontrollable once it strikes. The exact causes of this skin disease are not known and there have been no guaranteed measure in averting it. Diet, hereditary reasons, vitamin deficiency and stress are among the factors that have been closely attributed to acne infections. Still, it is best to find a good acne skin care regimen to ease and control its growth. An average person can make use of typical acne skin care methods. For severe forms of acne, consulting dermatologists is advisable in finding ways to lessen swelling and prevent scarring. Perhaps the best acne skin care regimen is to regularly wash your skin twice a day. Using a mild natural facial cleanser and warm water in washing your skin regularly can help remove dirt and pollutants. Using strong detergent soaps and scrubbing your skin can only worsen your acne problems. Too much scrubbing can aggravate acne and it can also open up blemishes. 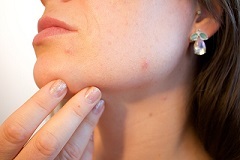 Popping pimples can make the blemishes to spread up causing more infection. Some astringents are too strong and can cause more skin irritation. Using astringents are only advisable for oily skin. Washing your hair regularly can also help in acne skin care. Washing hair, especially long ones, can help remove excess oil and dirt that might come in contact with the skin. Proper acne skin care also involves shaving and using the right razor. Choosing and testing for a comfortable safety razor is important when you have acne. Before applying the shaving cream, the beard can be softened by washing it with soap and water. Using a sharp blade and shaving lightly helps avoid cuts and rupturing pimples. Many acne skin care products and medicines for treating skin diseases can make your skin more prone to sunburn. Exposing your skin for a while to the sun may help dry up acne blemishes in the surface. Too much exposure to the sun can cause rapid skin aging, skin cancer and can make your skin drier. Individuals that are prone to acne and are being treated for it should use oil free cosmetic products. Benzoyl peroxide and other acne skin care treatment can redden the skin so applying regular cosmetics products might be difficult. Regular cosmetic products usually contain more fatty acids that are harmful to acne prone individuals. Looking for organic and acne skin care products that will match your skin tone can help avoid more infections. It is still best that one should consult a dermatologist before applying any acne skin care product or using different methods. Exerting more effort is needed for serious cases of acne infection to keep it from recurring. Observing proper acne skin care is important especially for younger individuals since blemishes and rashes tend to heal faster at a young age. Keeping a healthy lifestyle and diet can help restore the body’s vitality easily. Here is an additional ance skin care resource that shows you an all-natural way to become acne free in three days.